This section is accessible through the Cheat Sheet form page. Root Select this node, to activate the title Definition section. Introduction Select this node, to activate the introduction Definition section. Step Select this node, to activate the step Definition section. Sub-Step Select this node, to activate the sub-step Definition section. Add Step Button Add Step to Cheat Sheet Click this button to add a new step to the cheat sheet. This action is available when any of following nodes are selected: root, introduction, step. If a step or introduction node is selected, the new step will be added after the selected node. If the root node is selected, the new step will be added as the last step of the cheat sheet. Add Sub-Step Button Add Sub-Step to Step Click this button to add a new sub-step to a step. This action is available when any of following nodes are selected: step*, sub-step. Note*: Any step that either is optional or contains a command cannot contain sub-steps. If a sub-step node is selected, the new sub-step will be added after the selected node. If a step node is selected, the new sub-step will be added as the last sub-step of that step. Remove Button Remove Cheat Sheet Element Click this button to remove a step or sub-step. This action is available when any of following nodes are selected: step, sub-step. Note: In order to maintain cheat sheet validity, the following nodes cannot be removed: root, introduction, step (if it is the last remaining step in the cheat sheet). Up Button Move Cheat Sheet Element Up Click this button to move a step or sub-step up one position in order above their respective siblings. This action is available when any of following nodes are selected: step, sub-step. Down Button Move Cheat Sheet Element Down Click this button to move a step or sub-step down one position in order below their respective siblings. This action is available when any of following nodes are selected: step, sub-step. Preview Button Preview Cheat Sheet Click this button to preview and test the saved or unsaved contents of the edited cheat sheet in the Cheat Sheet view. 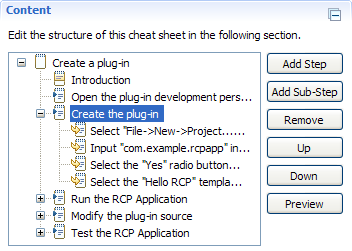 This convenient action allows you to observe how the edited cheat sheet actually appears and operates within its deployed environment without having to register the cheat sheet and launch another Eclipse runtime instance.